It was fall of 2015 when Carlie, a sophomore in high school at the time, realized something was off. She had been feeling sick, gaining weight, and was unsure of the cause. She thought, maybe it is her birth control. Maybe it will go away. Months later, at fifteen-years-old, Carlie learned that she was pregnant. Now seventeen and a senior in high school, Carlie is blessed with a beautiful daughter named Kayla, who has a loving and devoted adoptive family in Massachusetts. All the while, baby Kayla is growing and blessed by both the love from her forever family as well as the endless love from Carlie, her forever birth mom. We had the pleasure of speaking with Carlie about her experience: from pregnancy to adoption to where she is today. This is Carlie’s story. It has been a couple of years now since you discovered you were pregnant with Kayla. Thinking back, do you remember what your reaction was when you first found out? What did you do in that very moment? I think I was just really shocked. See, I was on birth control at the time and I even had used a condom. Never did I expect to get pregnant. Over the months, there were times I thought, “Could I be?” but that thought was always immediately shut down with a “No way.” It didn’t feel possible. It happened in September 2015 and as the months passed, I started getting really sick. That’s when my mom said, “Let’s go to the doctor; it could be your birth control.” I didn’t really say anything to her about the possibility of pregnancy at the time, because I really and truly did not think it could be that. We went to the doctors. They told us it couldn’t be the birth control, did a blood test, and said they would call me with my results. What did you do next? Did you confide in anyone about it? Pregnant. I thought, This can’t be true. I’m just a fifteen-year-old in high school. This can’t be true. That was in March of 2015. So that really confirmed it for you. Well my mom went out that night to pick up some more tests. She said she wanted to confirm the results. She got a package with two tests in it, but I was sleeping by the time she came home. I tried to go back to sleep and when the next morning came, my mom said, “Carlie, you have to go to school.” I was like, “I don’t want to go.” I just gazed at her and she knew. She said I could stay home. How did you tell Kayla’s biological father? I told him instantly. I said right out, “I’m pregnant.” He automatically knew it was his baby. His dad tried to have him to deny it completely, but he knew. Was he supportive? Was he involved at all in your pregnancy or your decision? I say I was under peer pressure because I thought it would be awkward if he just took me home after him asking and me refusing. I didn’t know what the outcome would be. Did the pregnancy impact your social life at all? No – I mean, everyone was shocked. They were surprised that it was me of all people that this would happen to. Because, I’m usually the quiet type at school. I always kept to myself, which is why everyone was just so shocked by it. No one treated me wrong, everyone was just genuinely worried about me. How did your pregnancy affect being in high school at the time? Well, it wasn’t noticeable at first that I was pregnant, because it was right before spring break that I found out. I told my counselors, superintendent, and principal first. Then I let the staff members know. It wasn’t like I could hide it from anybody, though I only told my friends at first. The way that everyone found out was in school, I was talking to my health teacher about it one day before class and she just kept talking about it as everyone started to come into the classroom. That’s when everyone was like, “What? What’s going on?” And then as soon as the class found out, it traveled through the whole school. But again, it wasn’t like anyone talked bad about me. They were just genuinely shocked. She then gave me my other two options. She said, “Okay, well you can either get an abortion or you can go through adoption.” And in my mind I was just like, I can’t see myself giving this child away, but I can’t see myself keeping a baby, either. So I thought abortion could bring the best outcome, I guess. I was going to get an abortion, but as soon as we pulled up to the building, I broke down crying. I thought, I can’t do this, there is no way I can do this. I couldn’t go through with it so I thought I might as well go with adoption. My mom started looking through adoption agencies and that’s how she found Adoptions With Love – because they work nationwide. Did you feel like you were making the right choice, making an adoption plan? Yes, I mean, if I was to keep the baby, I knew I wouldn’t be able to handle it. I wouldn’t be miserable, but I knew that we wouldn’t have had enough money. We would have been so behind. I was not ready for that. Do you feel like you had a lot of say in making your adoption plan? Do you feel like your wishes were heard and met, and that you could provide the life you wanted to for Kayla? Yeah. Adoptions With Love asked me what kind of family I wanted for my daughter and I wasn’t sure at first. They said it wasn’t a problem and sent me books of families to look at. They sent me people who were adopting, couples who weren’t able to have kids, families who already had kids. 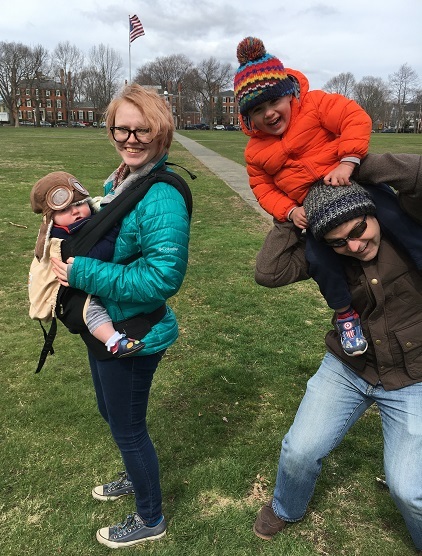 I really felt most comfortable choosing a family who couldn’t have children. It made me feel good to be able to give someone something that they weren’t able to do or couldn’t have on their own. Do you feel like adoption has also allowed you to pursue the life you want for yourself? That’s my thing, I didn’t want to be a single mom struggling for money. I didn’t want to be trying to pursue my own goals while caring for a child at the same time. It would have been hard and I didn’t want her to go through that with me – to have a struggling mom who didn’t have money. Because I know what that’s like. I know exactly what that is like. I’ve experienced that my whole life and that’s why I said I didn’t want her to go through what I had to go through. I wanted her to have parents who she could be proud of and I wanted to grow up so that she could also be proud of me. Did you end up choosing an adoptive family for Kayla? Yes – I picked Paul and Gretchen after coming across their book. Just reading it felt right. It felt like we had a lot in common and like they were already a part of the family. I can’t really put it into words but when I read their profile it just felt right. Did you meet them in person, before the adoption? Yeah, Adoptions With Love told them I was considering them as a potential family and asked me if I would be comfortable having a phone conversation. So we talked on the phone at first. And then when I met them, it just automatically felt right. Where did you end up meeting them? Were they in the hospital with you the day your daughter was born? Yes, they were in the hospital and the birthing room that day. I would spend time with Kayla and them in the mornings. There were also times where I would spend time by myself or I would let them spend time with Kayla alone. At night, I wanted her to go to their room to sleep. You are in an open adoption plan right now, yes? What’s that look like for you? Yes. I actually just went and visited Kayla and her adoptive family last March for my spring break. I was sixteen and a junior at the time. And you all still keep in touch? Yes, they send me pictures; I FaceTime them; I text them. It’s a very open plan. Are you happy with how things are going? Oh yes. I feel like the best thing I could’ve done was to have an open adoption. If I had kept my adoption closed, I would have been miserable not knowing what was going on with Kayla. I feel like this was the best route I could go. I’m still happy with it and I’m not ashamed of it. Everyone I talk to about it, they always say, “This was the right decision and I’m proud of you.” But I know that. I know this was the right decision for me and for my daughter. Is there any advice you’d give to other young women facing an unplanned pregnancy? I would just say that adoption is often the best way to go. If you’re not comfortable keeping it open or uncomfortable seeing your baby, even if you’re scared to be a part of her life, that’s ok. You can have a closed adoption plan. But I feel like having an open adoption was the best decision. What if you could go back to the fall of 2015 and give your younger self some advice? I would say that it gets better and you’ll be happy with what you did. It was definitely hard at first. My mom said it was going to be hard at first no matter what. You’re not going to go through this and be like, “Everything is fine.” No, it’s going to be hard. You’re going to have a hard time and you’re going to be upset about it some days. My mom thought I was going to need counseling. The adoption worker had given me information on counseling and I kept it, but I don’t think I’ll need it – I know what’s going to happen and I’m not going to get super depressed about it. The reason my mom was worried about it was because, when I was junior high, I was severely bullied. I went through a lot and it gave me depression. So she thought it might happen again. But I knew this wasn’t the last time I was going to see my daughter. I would tell myself, I know it’s going to be hard, I know I’m going to be sad, but it’s going to be fine. I know I’m going to get to see her, I know I’m going to talk to her adoptive family, I know I’m going to get pictures – So there’s no reason to beat myself up about it. Do you keep in touch with Adoptions With Love still? Sometimes – But they did tell me, if you need anything, contact us. If you need counseling, contact us. Or even if you just need to talk. But like I said, I was prepared for what could happen after the adoption and I wasn’t going to be too worried about it. I knew I could always keep in touch. If you or someone you love is facing a teen pregnancy, know that adoption can be a very positive option for those not ready to raise a child. If you would like to hear more teen pregnancy stories or get unplanned pregnancy support, you may call Adoptions With Love at 1-800-722-7731 or contact us here. 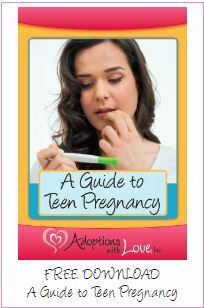 If you would like to learn more about your teen pregnancy options, please download our free Guide to Teen Pregnancy.